This course introduces the fundamentally important concepts associated with High Performance Liquid Chromatography (HPLC) analysis including hardware basics, modes of analysis, basic troubleshooting, column chemistry, important parameters of the mobile phase such as amount and type of organic solvents, pH, buffer strength and type, and much more. Suitable as a refresher for the more experienced analytical chemist or as an invaluable introduction to the technique for those with limited experience, this course provides a priceless insight into HPLC principles and practice. This course is not instrument-specific. "Chromatography is a physical method of separation, in which the components to be separated are distributed between two phases, one of which is stationary whilst the other moves in a definite direction". This is the IUPAC definition of Chromatography, with which we begin a thorough investigation of modern Liquid Chromatography, from the underlying theory of analyte distribution to a detailed study of the chemistry of the column, via the importance of mobile phase composition to the instrumentation of the HPLC system. The different components of the chromatograph (pumping systems, injectors, detectors, etc) are fully explored, as well as the fundamentals of data analysis. 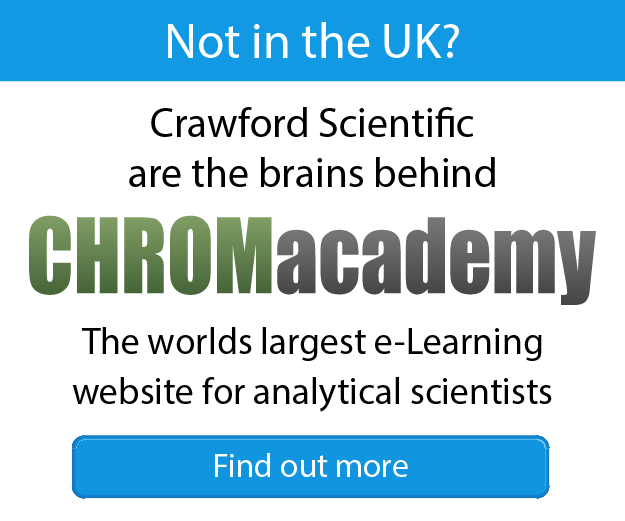 Users of LC in any of its modes (NP, RP, HILIC, IEX, SEC…) or anyone interested in gaining a deeper understanding of the chromatographic separation of compounds amenable to analysis by LC. No previous experience of chromatography is necessary, but a basic knowledge of chemistry is beneficial.